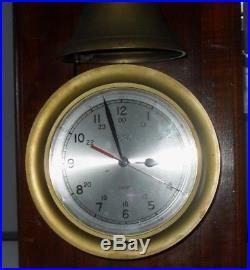 VINTAGE ACCURACY SHIPS TIME SOLID BRASS CLOCK BELL ON MAHOGANY WALL MOUNT. 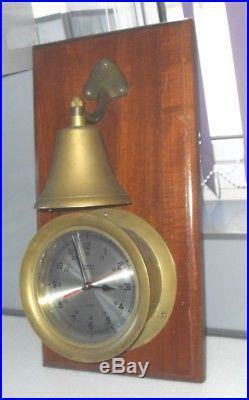 This is a combination of a brass ships clock and bell on Mahogany wall mount. It is marked with both 12 and 24 hours, There is a red second hand with a fantastic sweeping movement. It is battery operated using a D battery. Clock measures 7.5 inches diameter by 3.5 inches depth. The clock is a quality time piece, in great working order and keeps good time. 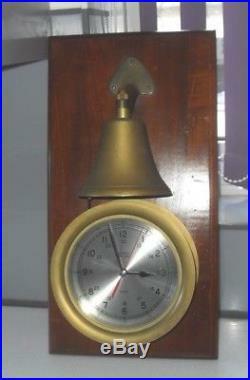 There is a striker fitted to the clock that should strike the brass bell, this does not work. The mahogany mount measures 19 by 10 inches. The whole item weighs over 5kg. The mahogany mount has a few scuffs and scratches. 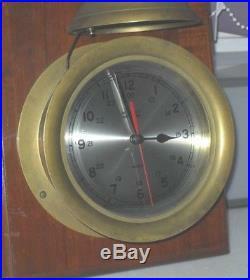 In all in good vintage condition, great working clock, bell striker not working. I do not clean or polish my items because I prefer to sell them in the original vintage condition then you can decide to clean to your own preference I like my buyers to see what they looked like when I bought them. I endeavour to list each item as accurately and as honestly as I can. 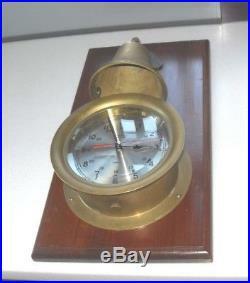 PLEASE TAKE A LOOK IN MY SHOP FOR OTHER NEW VINTAGE AND UNUSUAL ITEMS. 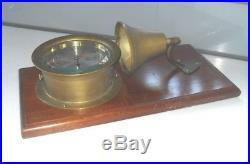 The item "LARGE VINTAGE ACCURACY SHIPS TIME SOLID BRASS CLOCK BELL ON MAHOGANY WALL MOUNT" is in sale since Tuesday, February 27, 2018. 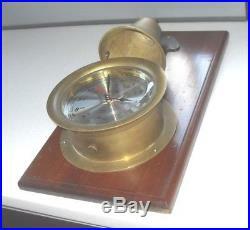 This item is in the category "Antiques\Antique Clocks\Other Antique Clocks\Post-1900". The seller is "justins8221" and is located in WORCESTER. This item can be shipped to United Kingdom, United States, Japan, Canada, Ireland, Australia, Germany, France, Greece, Italy, Spain, Russian federation, Antigua and barbuda, Austria, Belgium, Bulgaria, Croatia, Cyprus, Czech republic, Denmark, Estonia, Finland, Hungary, Latvia, Lithuania, Luxembourg, Malta, Netherlands, Poland, Portugal, Romania, Slovakia, Slovenia, Sweden, Brazil, China, Israel, Hong Kong, Norway, Indonesia, Malaysia, Mexico, Singapore, South Korea, Switzerland, Taiwan, Thailand, Bangladesh, Belize, Bermuda, Bolivia, Barbados, Brunei darussalam, Cayman islands, Dominica, Ecuador, Egypt, Guernsey, Gibraltar, Guadeloupe, Grenada, French guiana, Iceland, Jersey, Jordan, Cambodia, Saint kitts and nevis, Saint lucia, Liechtenstein, Sri lanka, Macao, Monaco, Maldives, Montserrat, Martinique, Nicaragua, Oman, Pakistan, Peru, Paraguay, Reunion, Turks and caicos islands, Aruba, Chile.